Tuesday, November 8, 2011 from 10 A.M. to 11 A.M. Please join us for a Congressional Briefing unveiling an important new report, “Alzheimer’s from the Frontlines: Challenges a National Alzheimer’s Plan Must Address.” This report offers insights and perspectives from the Alzheimer’s community on ten critical challenges the first ever National Alzheimer’s Plan must address. The National Alzheimer’s Project Act (P.L. 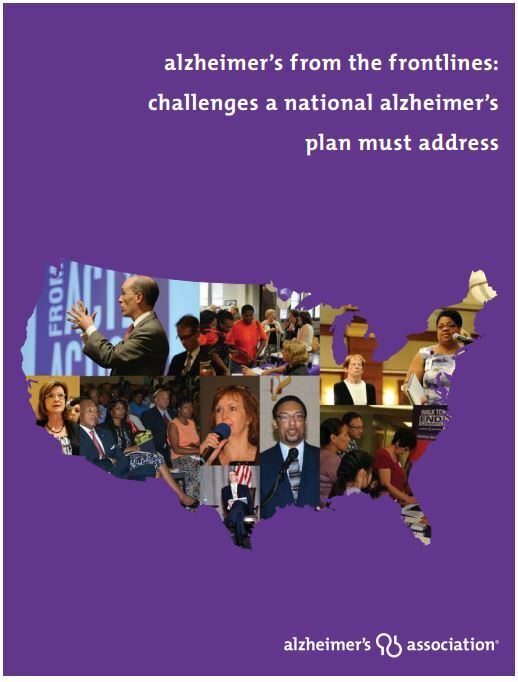 111-375), unanimously passed by Congress last year, requires the creation of a National Alzheimer’s Plan to address the rapidly mounting Alzheimer’s disease crisis and will coordinate Alzheimer’s disease efforts across the federal government. Building on the Association’s commitment to provide a platform for those directly affected by Alzheimer’s, the Association and its more than 70 chapters nationwide hosted over 130 input sessions throughout the country, allowing thousands of individuals to speak on behalf of all Americans counting on this effort to change the trajectory of this devastating disease for the millions affected today and the millions more at risk tomorrow. “Alzheimer’s from the Frontlines” provides a rare and unique window into the real, unrelenting challenges the disease forces on families year after year. I wanted to let you know about an upcoming event that may be of interest to you, your colleagues, and your constituents. On Thursday, November 18th, Friends of the NIA is co-sponsoring two educational briefings (one House and one Senate), titled “Leading the Way on Alzheimer’s Disease and Aging Research: A briefing about the vital work of the National Institute on Aging. The event is jointly sponsored by the Alliance for Aging Research, Alzheimer’s Foundation of America, Cure Alzheimer’s Fund, Friends of the NIA, and Leaders Engaged on Alzheimer’s Disease (LEAD). Links are provided below for the flyers for both the House and Senate briefings, listing time and location as well as confirmed speakers. Please feel free to disseminate these flyers through your listservs, websites, etc. Any assistance you could provide in helping to spread the word about this exciting event would be greatly appreciated. To RSVP for either briefing, please send an email to [email protected] confirming your plans to attend. Please feel free to disseminate this flyer through your listservs, websites, etc. Any assistance you could provide in helping to spread the word about this exciting event would be greatly appreciated. To RSVP for the Senate-side briefing, please send an email to [email protected] confirming your plans to attend.